A group of friends and new business associates travel by yacht to a meeting with Indian partners. Along the way they find a disturbed castaway who ends up causing their yacht to run aground on an island. This isolated location happens to be the habitat of a vicious missing link primate clan. Both researchers and the church are after this link for opposite reasons. What the survivors need to contend with are the killer beasts as well as a military trained team. While this is not exactly top entertainment, the modest budget gets stretched pretty well. 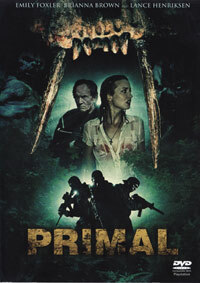 Neither a horror nor an action movie (with some of the creature scenes quite reminiscent of Predator), it should however be adequate for viewers simply wanting a movie to pass the time. PS. Not sure where the DVD synopsis notes on the South African cover came from, but it has nothing to do with the movie!